Nowadays, Christmas arrives by ship not sleigh. The labels of our new Christmas jumpers, novelty socks, toys and mobile phones reveal the global trade in manufactured goods and the huge distances they travel. Shipping is more energy efficient than road or air transport, but a lack of controls on ship exhausts and the poor quality of marine fuel mean 15% of global nitrogen oxides and 8% of sulphur gaseous pollution come from ocean-going ships. This matters because 80% of shipping is within 400km of land, and major sea corridors and ports are large pollution sources. In Hong Kong, the world’s fourth largest port, daily changes in ship pollution have been linked to heart attack frequency. Ship pollution can also be found in smaller port cities such as Cork, Gothenburg and Brisbane. Marine fuel is mainly residues from refining road and aviation fuel, and therefore contains most of the impurities. Vanadium emitted from ship funnels can be found in the air throughout Europe – in Paris and London, for example. But the greatest impact of shipping pollution in Europe is felt in Denmark and the Netherlands. Much of waters around the US and Europe are now pollution control zones for ships, requiring them to burn better quality fuel. This does help. Reduced sulphur in fuel from 2006 led to cleaner air in Dover and Rotterdam. Ships trading in designated emission control areas will have to use on board fuel oil with a sulphur content of no more than 0.10% from 1 January 2015, against the limit of 1.00% in effect up until 31 December 2014. The stricter rules come into effect under the International Convention for the Prevention of Pollution form ships (MARPOL) Annex VI (Regulations for the Prevention of Air Pollution from Ships), specifically under regulation 14, which covers emissions of Sulphur Oxides (SOx) and particulate matter from ships. These requirements were adopted in October 2008 by consensus and entered into force in July 2010. The emission control areas established under MARPOL Annex VI for SOx are: the Baltic Sea area; the North Sea area; the North American area (covering designated coastal areas off the United States and Canada); and the United States Caribbean Sea area (around Puerto Rico and the United States Virgin Islands). Outside the emission control areas, the current limit for sulphur content of fuel oil is 3.50%, falling to 0.50% m/m on and after 1 January 2020. The 2020 date is subject to a review, to be completed by 2018, as to the availability of the required fuel oil. Depending on the outcome of the review, this date could be deferred to 1 January 2025. Ships may also meet the SOx requirements by using gas as a fuel or an approved equivalent method, for example, exhaust gas cleaning systems or “scrubbers”. 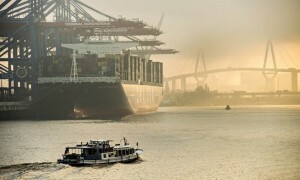 Air pollutant emissions from maritime transport can be transported over long distances and thus increasingly contribute to air quality problems in the EU. The Thematic Strategy on air pollution from 2005 concluded that sulphur emissions from shipping were forecast to exceed those from all land-based sources in the EU by 2020 (Source: Clean Air for Europe impact assessment, p31, 2005). Further action is therefore needed to improve human health and the environment. Directive 1999/32/EC regulates sulphur emissions from ships by limiting the maximum sulphur content of marine fuel. This Directive was amended by Directive 2005/33/EC that designated the Baltic Sea, the North Sea and the English Channel as sulphur emission control areas (SECAs) and limited the maximum sulphur content of the fuels used by ships operating in these sea areas to 1.5% (frequently asked questions). This fuel standard applies also to passenger ships operating on regular service outside SECAs. However, already at the time of adoption the SECA fuel standard was widely recognised as being insufficient to address observed environmental impacts from shipping. Due to the international dimension of the shipping industry, environmental, security and safety standards are developed by the International Maritime Organization (IMO), a United Nation’s specialized agency. Directive 1999/32/EC as amended transposes provisions of Annex VI of IMO’s Marine Pollution Convention, MARPOL 73/78. The Commission called for action at the International Maritime Organization (IMO) to further reduce emissions and in October 2008 an amended Annex VI was adopted that further reduces the maximum sulphur content of marine fuels inside and outside of SECAs. The European Parliament and the Council requested the Commission to report on the implementation of the Directive and to consider submitting a proposal for an amendment. Following this request and considering the development at the IMO in 2008, the Commission carried out a review of the Directive and adopted a proposal for its revision on 15 July 2011. Finally, Directive 2012/33/EU amending Directive 1999/32/EC was published in the Official Journal of the European Union on 17 November 2012. The deadline for bringing Member States’ legislation in compliance is 18 June 2014 and the amended Sulphur Directive will enter into force 1 January 2015. Information on EU policies on policies to reduce greenhouse gas emissions from shipping can be found here.